Another overnight hard sleeper brought us to the town of Xi'an. In our conversations with fellow travelers along the way, we weren't expecting much. 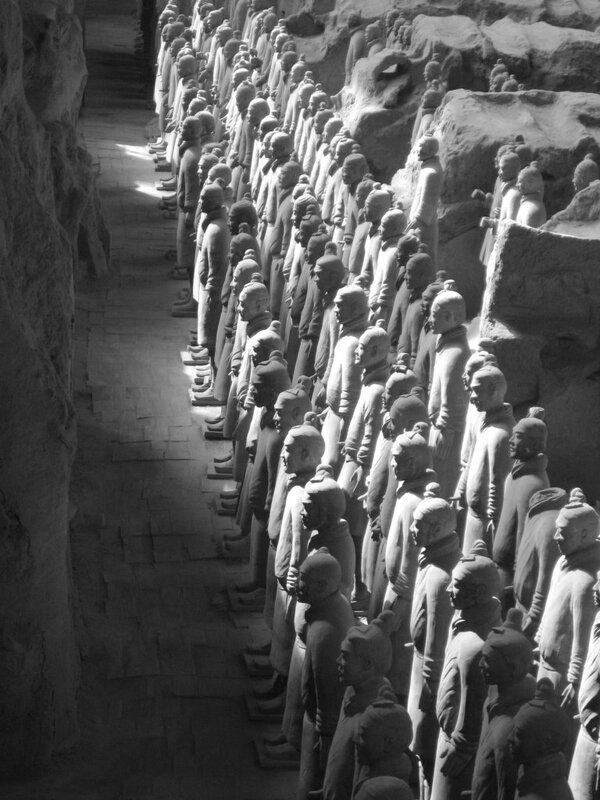 People had pretty much just described it as a means as an end to visit the Terracotta Soldiers and then be off. With a population of over 6 million, we were expecting dirty, expensive and not much in the way of charm. Instead, we found our first completely relaxing stop in China. One wouldn't expect to find it amongst the endless streams of pedestrians, buses, taxis and cars but we did. Xi'an was a very pleasant surprise. After getting off the train we (really for the first time of the trip) let ourselves get sucked in by the touts. (Becca kept saying "it's all good as long as you're using the touts instead of them using you. ")The result in the end though was good; a centrally located hostel for the price we were looking for. The center of Xi'an is inside of an ancient wall with the striking Bell Tower being ground zero. This ended up being a great area to wander around; lots of nice open public spaces, much better air quality than our previous stops, lively nightlife and incredibly clean. Throw in the incredibly tasty return of the cheap street food and we were very happy campers. It was also very nice to have a few days where we stayed in the same place. May not seem like much but it was a very needed chance to catch our breath. It was just nice to have the chance to actually sleep in a bed and prepare for our trip out west. In our three plus days, we did a fair amount of exploring, including a trip to the surprisingly interesting and informative Shaanxi Museum. Within Xi'an itself though, the highlight was the Muslim Quarter. Not more than a quarter mile from our hostel was a 5-6 square block area where Chinese Muslims and amazingly good cheap food reigned. We made countless trips there, snacking our way through the area and just soaking in the scene. Very similar to the various ethnic enclaves found in countless cities around the world but very cool. Outside of Xi'an, our trip was an obvious one. 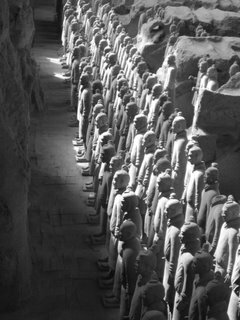 We joined up with Leslie (one of the Canadians we'd done the tour in Datong with) and headed out to see the Terracotta Warriors. Instead of paying 300 Yuan/person for one of the tours with no guarantee other than the fact that we'd be stopping at plenty of jade and pottery factories, we elected to take the public bus out to the warriors. Pretty uneventful ride though there was a revolving set of tour guides who'd get on, say their bit about the upcoming attraction (the stops were all tourist attractions along the way) in Mandarin and jump of. Needless to say they weren't on the return trip. - Two interesting points about the warriors that I didn't know before. The warriors were actually originally pillaged in the peasant revolt (not surprisingly they revolted since they'd just spent the past 40 years building the tomb) and the ones found had been scattered about. Also, I had no idea that they'd all been painted. It just increased the level of respect I had for the people that made them; not only did they do different faces, armor, hairdo's, etc. but they painted them. Very impressive. - We had an interesting discussion about the amount of work (40 years by a ton of people) and the value of something like this. In so many ways (much like many of the churches in Europe) it's a waste of human talent for something that probably doesn't need that level of extravagance. It makes a great tourist attraction but was it really such a good thing? Becca did raise the valid point that at least in this case, the Emperor decided to have the warriors made instead of following past (and some future) precedent and just throwing in live warriors, concubines, etc. A kind and gentle despotic emperor I suppose. - The 4 hours we spent at the facility had us around more Western people than we've been around at one time since Denmark. I'm VERY happy we have NZ and OZ as a bridge between Asia and heading home. Not that it's good, bad or otherwise, it's just a shock hearing that much English being spoken and seeing that many similar people in one place. A bizarre feeling and one that made it really hit home how much we've been out of our element for the last four months. And how much I've enjoyed it. And hated it. More on that in a later post. So congrats to Xi'an, somehow a welcoming haven disguised in a town of six million. Thank you for giving us a chance to recover and get ready for the adventures ahead in the west. My stomach is already anticipating the Yak Burgers and yak butter tea with glee. Errr...I hate to be the one to break it to you, but all things 80's are back in the U.S., as well. Not as prominent, but definitely there. Mostly with the "hipsters." Yeah...maybe by the time you return we'll be in the early 90's seed of grunge?